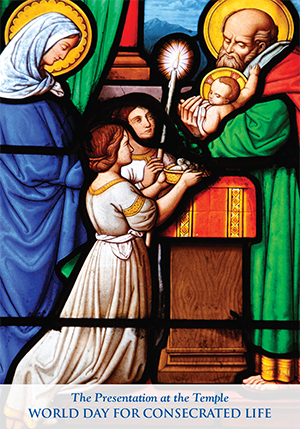 The 20th annual World Day for Consecrated Life is being celebrated Tuesday, February 2, the Feast of the Presentation of the Lord. It will be celebrated in parishes on February 7. On February 1 Pope Francis met in Rome with about 5,000 men and women who were present to mark the closing of the Year for Consecrated Life, which began Nov. 30, 2014, and ends February 2. When religious communities, male and female, have only one or two novices, when bishops tell him they have only four or five seminarians, “this tempts me to lose hope,” Pope Francis said. But the answer to the shortage of vocations is not despair or admitting all comers to relgious communities he said. The annual celebration of World Day for Consecrated Life was begun by Pope St. John Paul II. The day invites the entire Church to reflect on consecrated life, pray for those in consecrated life, and thank God for their service and mission. Those in consecrated life include religious sisters, nuns, brothers, religious priests, and monks who have professed vows and life in community. All who become followers of Christ through the consecrated life bless the Church.